Where targetNode is a reference to an HTML Node. You can grab one easily using document.querySelector(). Sometimes we need to see what the scopes look like on the page to effectively debug our app. 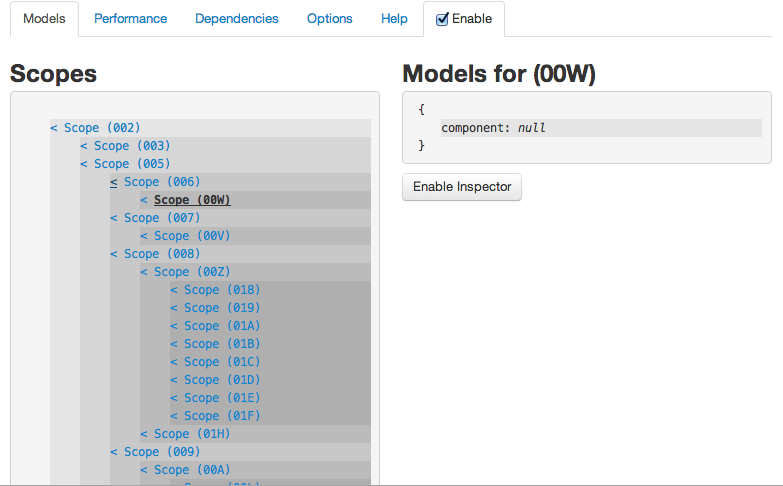 The AngularJS Batarang is a Chrome extension that shows the live scope hierarchy and has some other really helpful features. We can then call methods on that service just like we could if we injected it. This last one is more advanced and not used as frequently. $(selector) and $$(selector): A quick replacement for querySelector() and querySelectorAll, respectively. Thanks to @zgohr for this tip! With a few simple tricks we can access the data for any scope on the page, inspect the scope hierarchy, inject services, and control directives. So the next time you want to make small tweaks, check your work, or control an AngularJS app from the console, I hope you’ll remember these commands and find them as useful as I do!